Through the protection of life, property and the environment, Fire Rescue Services improves the livability of all Edmontonians. The provision of internationally-recognized frontline fire rescue services, fire prevention programs and public education make the city a safer and healthier place. The City of Edmonton's Office of Emergency Management was established in 2002 to create, implement and maintain an all hazards emergency management program that ensures the City is prepared for, can respond to and recover from major emergencies. 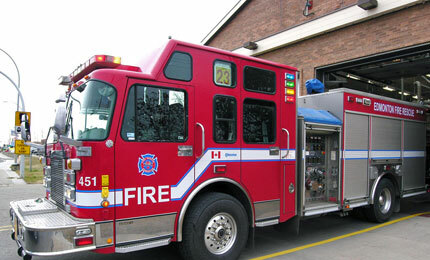 This area also conducts all fire and explosion investigations that occur within Edmonton, as well as develops, implements and delivers fire safety public education and awareness programs. Logistics coordinates management of Fire Rescue capital assets, facilities, apparatus fleet and inventory, personal protective and safety equipment, as well as supply needs. This program area also provides oversight of occupational health and safety programming, including employee physical and mental health wellness. Technical Services manages all Emergency Response Communications, call evaluations, dispatch services, public safety technology and mapping as well as continuous improvement processes, including fire accreditation and data analytics. All 911 calls forwarded to Fire Rescue Services are coordinated by the Emergency Communications Specialists at Dispatch Services. They evaluate all incoming emergency fire calls and then dispatch appropriate Fire Rescue Services personnel and apparatus. Emergency Communications Specialists also provide support and information to on-scene incident commanders throughout events, as well as liaise with other emergency response agencies, civic agencies and utility companies to ensure events are mitigated. Dispatch is an important part of helping Fire Rescue Operations provide public safety coverage to Edmontonians 24 hours a day, 7 days a week, 365 days a year. After leaving the station, fire rescue first responders are targeted to be on scene within 4 minutes travel time to initiate emergency medical or fire rescue services. In the case of a fire, a crew of 16 firefighters is targeted to be on scene within 8 minutes travel time. Do not use efrsinfo@edmonton.ca in an emergency. When contacting Fire Rescue Services via this email address, you will receive a response within 3 business days.